January 10, 1952 — Old Newhall Jail. Photo by Glickman/Los Angeles Herald Examiner. Plans for the first Newhall jail were hatched in 1888, when the County of Los Angeles decided to give constable John Howe — the local law since 1878 — a place to lock up prisoners. The jail was going to be built on a plot of county-owned land at the end of modern-day Arch Street near Newhall Creek. But Newhall train station master John T. Gifford didn't take too kindly to the idea of prisoners being housed next door to his family home, so bought a parcel at 1026 Spruce Street for $68 and talked the county into swapping the land. Gifford was financially the loser, but his peace of mind apparently outweighed his cost. John H. Castleman submitted a bid for the construction of the jail in September, 1888. Castleman made two proposals: he could build a wooden, two-cell jailhouse measuring 12' by 20' for $236.25 (including $123.75 worth of lumber and $5 worth of iron bars), or a slightly larger 13' by 22' structure for $248. It is not known which bid was accepted or how big that first jailhouse was. In fact, there is some confusion as to whether the jail was built at all. According to county records, Gifford didn't sign the Spruce Street property over to the county until December 22, 1905. Whether it would replace the old jail or be built for the first time, a new jail was put to bid in January 1906. Bids were advertised in the Los Angeles Daily Journal and the Contractor and Builder. On January 31 Gifford's grant deed was recorded, and on February 20, a bid from a Mr. H.C. Register was accepted in the amount of $2,237. In 18 short years, the price had gone up 10 times. Architectural plans, drawn by Hudson & Munsell of Los Angeles, called for the construction of a concrete building with a 1/4-inch thick steel door covering. Construction was competed by May, 1906, when the windows were covered with heavy screens and the interior walls were whitewashed. Repairs to the building were done as early as September of that same year, and on numerous occasions thereafter, with work orders signed by constables W. Ed Pardee, Martin Cruzon and Carl Sischo. The building was appraised for the first time in 1929 at a sum of $2,000. Records from the Newhall Sheriff's Station (Substation No. 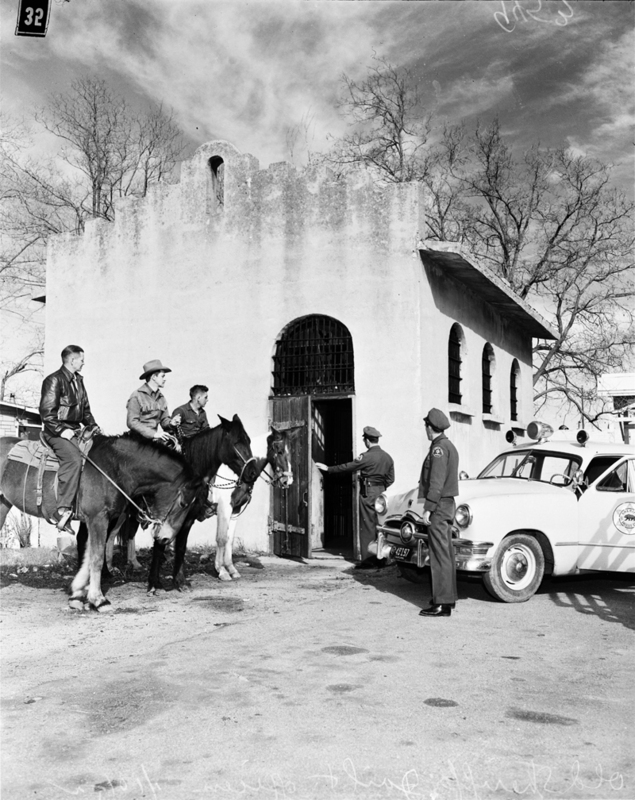 6) indicate that the jail housed an estimated 250 prisoners between January and October of 1939, after which time the jail was no longer used, and the cells which had been added onto the Sheriff's substation in 1928 were used instead. The jailhouse and lot were sold sometime after 1939 and were used for various commercial purposes in the decades that followed. — Information compiled by Estelle Foley for the Santa Clarita Sheriff's 70th Anniversary Celebration. SW5201: 19200 dpi jpeg from digital image, Los Angeles Examiner Collection, USC Libraries Special Collections.